Welcome to the Australian Climate Madness Summary. We hope the points set out below may give you some food for thought concerning climate change. For hundreds of years, scientific advancement has proceeded on the following basis: first, a hypothesis is proposed to explain a particular natural phenomenon; secondly, that hypothesis is used to make predictions about what may happen in the future; thirdly, the empirical observations are compared with those predictions; finally, if the observations match the predictions, it can be concluded that the hypothesis accurately models the natural phenomenon, and can be awarded the status of a theory. However, if they do not, or if a result is obtained at some point in the future that does not fit the hypothesis, then the hypothesis must be modified, new predictions made and new comparisons made with observations. This process will often go through many iterations. But is this really the case? Is the science really settled? If that were in fact the case and the evidence was so compelling, why is it that climate scientists need to “massage” data? Why is it that scientists who promote the alarmist agenda refuse to debate the issues? Why won’t Al Gore, responsible for the most popular climate change film An Inconvenient Truth, debate the claims raised in the film? [We know why, of course: many of them were just plain wrong.] Why are those who question the “consensus” often ostracised by their peers in the scientific community, silenced or even threatened? These are important questions to which answers should be sought. Presently in Australia, the mainstream media and the Gillard government have closed their minds to any dissent from the “consensus” on climate change, namely that man-made emissions of carbon dioxide are causing dangerous global warming. The Gillard government will not entertain any debate on the science, preferring to simply rely on the pronouncements of the politically driven Intergovernmental Panel on Climate Change (IPCC – part of the UN), and insisting on enacting a price on carbon, be it a carbon tax or the “carbon pollution reduction scheme”, a name intentionally chosen to mislead the public (it is the colourless, harmless gas carbon dioxide that is to be reduced, not elemental carbon in the form of soot, and it is not pollution). Similarly, the majority of the mainstream media has already made up its mind and only publishes articles which advance the agenda of dangerous global warming (see here for a textbook example of media bias). IMPORTANT: We are not seeking to change anyone’s mind. All we seek to do is give readers the opportunity and the tools to find out more for themselves. If, after doing such research, readers are still convinced that AGW is real and dangerous, then at least they have been exposed to both sides of the story. The earth’s climate is always changing – it has for 4.5 billion years and will continue to do so – to speak of climate change as if it is something “new” is misleading. There is nothing particularly special about the climate we live in at the moment – it is very benign compared to some of the alternatives – but to attempt to stop the clock and “freeze” the present state is misguided. That the earth is currently in a long-term warming phase is not in dispute. It has been since the end of the last Ice Age, and in particular since the end of the Little Ice Age a couple of hundred years ago. It is therefore not surprising, nor alarming, that temperatures today are higher than they were a century ago. However, the cause of that warming is where the dispute arises. There is no historical link (on geological time scales) between the harmless gas carbon dioxide (CO2) and temperature. Levels of CO2 have been far higher (thousands of parts per million compared to a few hundred at present) in the past without the planet entering “runaway global warming” or passing “tipping points” from which it could not recover – the fact that we are here today is evidence enough of that. Al Gore’s An Inconvenient Truth showed a large graph of temperature and CO2 fitting together very closely, except that it was at such a small scale that it was not possible to determine that rises in CO2 actually lag behind rises in temperature (and vice versa) by about 800-1000 years. The long term warming and cooling of oceans releases and absorbs huge quantities of CO2. On shorter time-scales, temperatures rose in the early part of the 20th century with little or no man-made emissions of CO2. They also fell in the period 1950-1970 when CO2 emissions were rising rapidly in the post-war economic boom. The link between future global warming and CO2 is based predominantly on computer climate models. None of the computer models predicted the pause in warming (and even slight cooling) we have seen since 2001, despite rising emissions, so we must assume those models are flawed. Every day, new peer-reviewed scientific studies change our understanding of the climate – to say the “science is settled” is pure hubris. The livelihood of many (most?) climate scientists depends on perpetuating the existence of the climate crisis, and there is presently a worrying lack of impartiality in this discipline. Studies are written with a pre-conceived agenda in mind, and the peer-review has, to an extent, been corrupted – in other words, alarmist papers are being reviewed by similarly alarmist reviewers. The story of the Michael Mann hockey stick is a prime example of how scientists with an agenda can manipulate data in order to produce the desired (alarmist) result – see here to read more about this particular example. The media and the government have already closed their minds to the subject – you will rarely read anything that contradicts the so-called consensus in the mainstream media. Hence the importance of the blogosphere and independent sources of information on climate. The IPCC attributes the current warming almost entirely to man-made CO2. This is obviously in the UN’s interest, since CO2 emissions can easily be regulated, unlike any other causes of climate change. This allows the UN to “blame” developed economies for the current warming, and force them to accept reductions in emissions in order to tackle climate change. Western government policy is based on the results of computer models which we have already seen are flawed. Schemes such as the Australian CPRS, otherwise known as the Emissions Trading Scheme (ETS) will achieve nothing in terms of altering the climate – Australia produces less than 1.5% of global emissions. Even if we reduced those to zero overnight (a 100% reduction), it would make no difference to the climate (even if we assume that CO2 is the primary driver of temperature). So Kevin Rudd’s 5 – 15% will achieve less than nothing. The ETS will do enormous damage to our economy and the standards of living of everyone in society, but especially poorer families who will be burdened with higher electricity, gas and food prices – whilst doingnothing for the climate. There seems to be, amongst Western societies generally, a desire to “do something” in order to assuage our collective guilt for 200 years of economic progress (although why we should feel guilty about this is a mystery, since that economic progress has lifted billions of people out of a miserable life of poverty). For some reason we are embarrassed about our standards of living, and believe that we must engage in a quasi-religious penitence for the sins we have committed against the planet (see here for an excellent comparison between climate change hysteria and religion). History shows us that environmental causes have often been used to advance political agenda. This is evidenced by the allegiances of environmental (“green”) and/or climate change activists, many of whom align themselves with socialist ideals (witness the composition of demonstrators at climate change protests – primarily from the political left). In Australia, the Gillard government is determined to push through with a price on carbon despite the fact that the rest of the world has baulked at taking any concrete action, both at Copenhagen and now at Cancun. The Gillard government is also hamstrung by its deal with the Greens, who are pushing for crippling cuts to emissions in very short timescales (the Greens inhabit a utopian fantasy world, of course, utterly disconnected from reality, so this is hardly surprising). This may leave Australia in the position of having binding emissions reduction targets when much of the rest of the world has none. The inevitable result of this will be the export of local jobs and industry overseas. 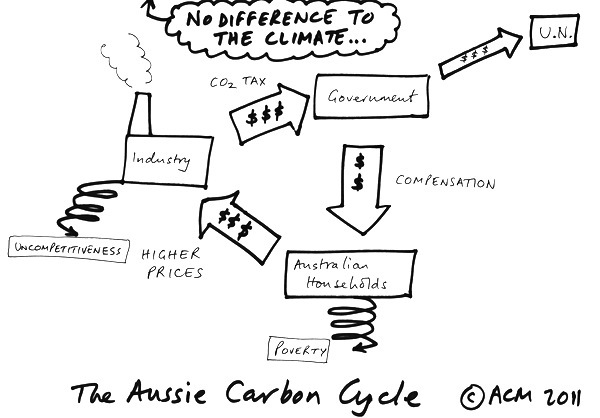 ACM believes that any price on carbon in Australia is a pointless political gesture for a country that produces less than 1.5% of global emissions, since it will have no effect on the climate whatsoever, but if we have to have it, we should at least make that decision with the knowledge of what other countries will commit to. ACM is fully supportive of reducing pollution – and by that we mean proper pollution, particulates and toxins, and not CO2, which is a harmless gas and essential for all plant life on earth – from our environment. ACM is also fully supportive of conserving limited natural resources. However, the cost/benefit analysis based on these goals simply does not add up. If you consider all the above points and dismiss them, then that is your prerogative. However, ACM’s view is that unless or until it is proven beyond reasonable doubt that the present warming is solely or primarily caused by man-made CO2 emissions, policies to reduce those emissions are pointless, and should be strongly resisted. Such policies will send millions of people back into poverty. ACM exists to communicate an alternative viewpoint to the one-sided presentation of climate change issues provided by the Australian government and mainstream media.